Remember "Journey to the West"? Maybe you called it "Monkey Magic"? Well, whatever you thought it was called, the show was an iconic, often trippy, epic adventure following a monk and his godly companions. And now the series, which was a Japanese adaptation of a Chinese novel, is getting another makeover as ABC, TVNZ and Netflix announced filming began on their updated version, "The Legend of Monkey". Inspired by the folktales of 16th Century China, "Legend of Monkey" will be a 10-part half hour series following a teenage girl named Tripitaka (Luciane Buchanan) who is joined by three fallen gods Monkey (Chai Hansen), Pigsy (Josh Thomson) and Sandy (Emilie Cocquerel). The four set out on a dangerous journey (to the west!!!) to fight a demonic reign of chaos and terror and bring back balance to the world. 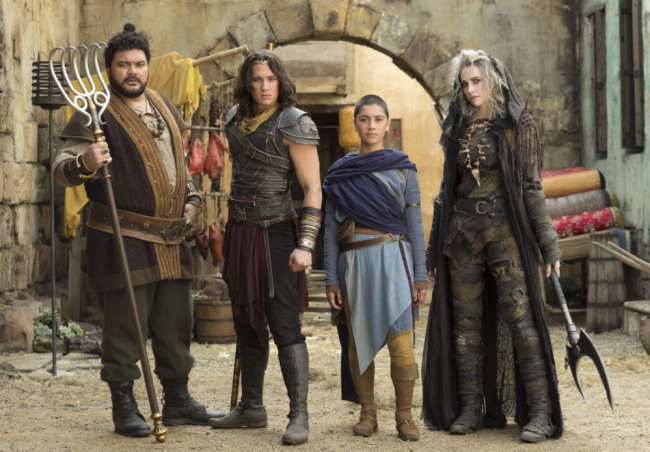 Promotional picture for joint ABC/TVNZ show The Legend of Monkey, featuring cast (from left) Josh Thomson, Chai Hansen, Luciane Buchanan and Emilie Cocquerel.